The Murney Tower Redoubt was built in 1846 because of the Oregon Crisis to defend the western approaches to Kingston and the St. Lawrence River from an American invasion. In dispute during this crisis (resolved by treaty 15 June 1846) was the boundary between British North America and the United States west of the Rocky Mountains, but there was concern hostilities might break out elsewhere. Similar Martello towers can be found in Quebec City and in New Brunswick and Nova Scotia. 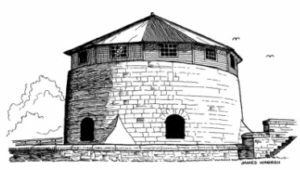 The four Martello towers (Murney Tower, Shoal Tower, Cathcart Tower and the Fort Frederick Tower) in Kingston – along with Fort Henry and the Market Battery – represented the city’s contribution to the defence of British North America. In 2007, Murney Tower became part of the Rideau Canal and Kingston Fortifications World Heritage Site – the 14th World Heritage Site in Canada and the only one in Ontario. The name Martello is a corruption of the word Mortella, which refers to Mortella Point on the Mediterranean Island of Corsica. Martello Towers were first encountered by the British, during their efforts to conquer Corsica during Napoleonic Wars. The British encountered extreme difficulties during a seige on a medieval tower. The combined firepower of HMS Juno and HMS fortitude of over 100 cannons could not destroy the Tour de Mortello. Although a landward infantry assault would eventually capture the tower, the tower’s garrison of some 2 dozen soldiers and cannon proved effective at holding back a much superior force. In 2007, the four Martello towers in Kingston; Murney Tower, Shoal Tower, Cathcart Tower and Fort Frederick Tower, became part of the Rideau Canal and Kingston Fortifications World Heritage Site – the 14th World Heritage Site in Canada and the only one in Ontario. Murney Tower was thankfully never used in a conflict. For years it was used as a barracks for soldiers and their families. Eventually in 1885 it was abandoned by the military and fell into disrepair. During this time the tower also attracted looters. Almost all the brick on the main floor was stolen. Thieves also managed to make off with a 1000lb cannon. The danger of not maintaining the tower was revealed when, in — — , a major windstorm blew the roof right off the tower. Tragically, the roof killed a small boy who was in the park across the street from the tower. “The Construction of the Murney Tower – A Diary of 1846”. Historic Kingston. 29 (1981): 42-52.